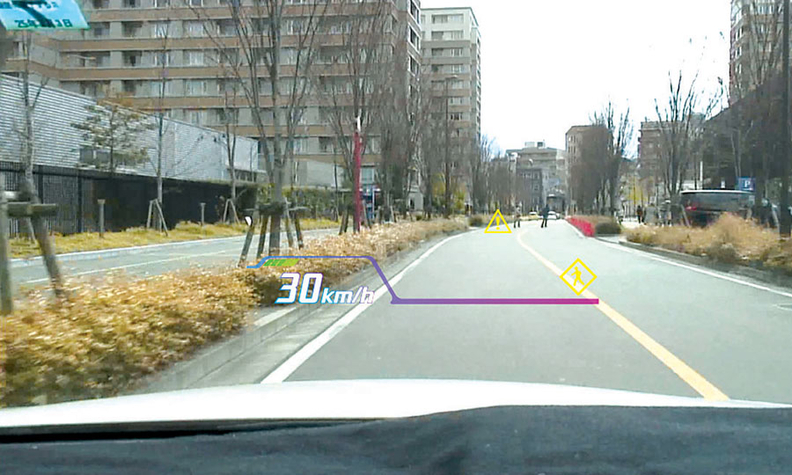 Head-up display developers such as Denso are experimenting with systems that could project warning symbols on the windshield if a pedestrian or obstacle is in the road ahead. Head-up displays are getting a fresh look as safety-alert devices. Suppliers such as Denso Corp., Nippon Seiki Co., Continental AG and Delphi Automotive are developing head-up displays that project larger, brighter and more detailed images onto the windshield. Developers are touting head-up displays that could, in theory, project a warning symbol in the motorist's line of vision to draw attention to a pedestrian or obstacle in the road. And if the motorist is using route guidance, an arrow might be superimposed over the exit ramp. A head-up display also could highlight familiar functions such as speed, turn-by-turn navigation or radio stations. The idea is to keep the motorist's eyes on the road. But the range of information for display is limited, engineers and planners say. They want to avoid cluttering the driver's view with Facebook postings or text messages, says Reben Werman, engineering manager for Denso International America Inc.
"We're selling this as a safety feature, not as a comfort feature for activities that people shouldn't be doing in their car," Werman says. Head-up displays project light onto the windshield, creating an image that appears just above the hood about five to eight feet beyond the windshield to prevent focus problems for drivers. The technology, long used in military aircraft, debuted on mass-market production vehicles in the late 1980s. During the SAE Convergence 2012 conference on vehicle electronics last month in Detroit, Silviu Pala, Denso's director of technology management, described a scenario in which driverless vehicles would have head-up displays that could project images across the entire windshield. The technology for such a powerful head-up display doesn't exist yet, and driverless vehicles are still in the experimental stage. But automotive engineers are racing to develop head-up displays that project images large enough to provide an "augmented reality." The device could, for instance, highlight the edge of the road if the vehicle is driving through fog. Or the head-up display could highlight a pedestrian or other obstacle in the road. To do that, suppliers must develop devices that can project larger, brighter images with better contrast. Some global suppliers are racing to be first. But the inside track may belong to Nippon Seiki, which supplies General Motors, BMW and others. Nippon Seiki is the world's leading producer of head-up displays. The Nagaoka, Japan, supplier is expected to account for half of the estimated 500,000 head-up displays to be produced globally next year, according to "The Hansen Report on Automotive Electronics" news-letter. Global head-up display sales are expected to increase 16 percent annually, says Paul Hansen, publisher of the newsletter. But head-up displays cost about $150 to $250 per unit, Hansen says, a high price for mass-market automakers to pay. In the near future, Hansen expects the feature will be mainly restricted to cars priced more than $30,000. Hansen expects the number of automakers using head-up displays to rise from nine now to 14 by 2016. But he's skeptical of suppliers' claims about devices with large displays. The technical challenges are daunting. The hardware -- now the size of a college textbook -- would have to be even larger to accommodate the optics required to project such a large image. A head-up display device big enough to project onto an entire windshield -- or a large portion of it -- would take up half the space behind the instrument panel. And such projectors emit lots of heat. To solve some of these problems, suppliers have experimented with head-up displays that project laser beams to create the images. But lasers tend to be fragile in very hot or very cold weather. Another reason for head-up displays' high cost and low penetration rate is that each device must be calibrated to its vehicle's windshield. Windshields have tiny warps in the glass, which usually don't matter to motorists looking through them at the road. But when head-up displays project information onto a windshield, those flaws can lead to highly visible distortions unless the devices have been carefully calibrated. To get around that problem, suppliers have designed less expensive, so-called pop-up panes positioned inside the windshield in front of the driver. But the quality of those images is lower than those of standard head-up displays. Because of these and other technical challenges, Hansen does not expect large head-up displays anytime soon. "I think it will be way cool someday when a barely visible pedestrian will be highlighted on the windshield by your HUD," Hansen says. "But it will be well over five years before we see HUDs that large." Werman agrees that head-up displays that can augment reality are years away. But automakers privately express great interest in it, he says. "Every automaker is aware of it, and there is a race among the suppliers" to design head-up displays with bigger images, Werman says. A full-screen head-up display "is the long-term Holy Grail that everyone is trying to get."